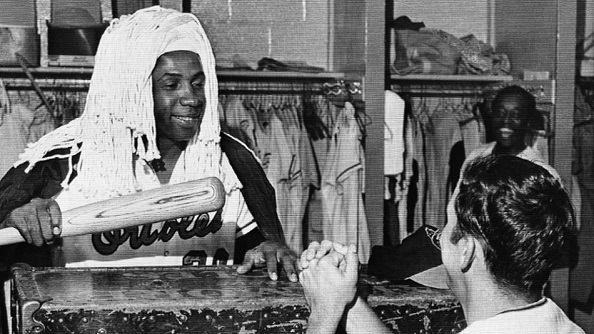 The Hall of Famer and baseball's first black manager played the game hard but preferred to break barriers quietly. Davey Johnson pleading his case to Judge Robinson. Hall of Famer Frank Robinson lost a long battle with bone cancer at 83 Thursday. Baseball lost a lot more. It lost a top of the line player, its first black manager, a man who didn’t back down without a fight, and—maybe his least appreciated quality outside his clubhouses—a man with a wicked sense of humour. Once when the Orioles’ team bus approached a junk yard, Robinson ordered the driver to stop at the yard—so less-than-sure-handed outfielder Curt Blefary, whom Robinson nicknamed Clank, could pick out a new glove. Then, when the Orioles won the 1969 pennant by beating the Twins in the first American League Championship Series, Robinson’s jubilation extended to their coming opponents. “Bring on the Mets and Ron Gaspar!” Robinson hollered in the clubhouse. Exactly why he singled out that particular Met remains little known, but reserve catcher Merv Rettenmund corrected him: “It’s ROD, stupid!” Retorted Robinson: “Then bring on the Mets and Rod Stupid!” The bad news, of course, was the Mets making the Orioles look stupid in the World Series, sweeping them four straight after the Mets lost Game One. The good news, among others, was Robinson inaugurating a kangaroo court in the Oriole clubhouse upon his arrival in a trade from the Reds for 1966. By 1969, inspired by the fabled Pigmeat Markham "here come the judge" routines on Rowan & Martin's Laugh-In, he wore a clean white string mop on his head and used his bat for a gavel. The court convened after Oriole wins; it brought a new shaft of levity into the team especially when they won their first World Series in 1966 and then romped to the American League East title in 1969, division play's first season. After Blefary was traded to the Yankees and he faced the Orioles for the first time as an opponent, he was silly enough to say his former team weren’t going to win “because they don’t have a big red S on their shirts.” The next day, during pre-game batting practise, Blefary was greeted by Robinson, outfielder Paul Blair, and pitchers Mike Cuellar and Moe Drabowsky surrounding him. With all four wearing Superman shirts. Robinson became an Oriole in the first place because of one of the great front-office brain farts of baseball history. The National League’s 1956 Rookie of the Year in Cincinnati, Robinson had a splendid 1965 for the Reds but the Reds thought, not unreasonably, that they needed to fortify their pitching staff. (One fascinating story to tell might be that of just how on earth the 1960s Reds developed so much pitching talent but found most of it bedeviled by arm and shoulder troubles.) And they had their eyes on Orioles pitcher Milt Pappas. One of the once-vaunted Baby Birds rotations of the earliest 1960s, Pappas in 1965 had a 2.80 ERA and a 3.24 fielding-independent pitching rate, though baseball brain-trusters didn’t ponder FIP in those years. Needing a more physically dependable arm to pair with ace Jim Maloney (on the threshold of his own shoulder issues, though the Reds didn’t know it at the time), the Reds’ pitching in 1965 had the second-worst overall ERA in the National League and surrendered the most walks. He’d been bothered by a few leg injuries and a dubious 1961 arrest—Robinson was so angered by a short order cook’s racial taunting in a diner that he showed a .25 pistol he carried (for protection, since he habitually carried large amounts of cash) without realising a police officer was nearby to see it, according to a 1963 profile. Robinson paid a $250 fine and refused to talk about the incident otherwise, other than to say how stupid he’d been to show the pistol in the first place. One contract holdout plus a 1962 postseason comment in which Robinson thought aloud about quitting the game after the Reds couldn’t win a second straight pennant—which moved manager Fred Hutchinson to demand owner/general manager Bill DeWitt give him a fat raise—may have moved DeWitt toward finding a way to move the outfielder who is still the best all-around position player in the Reds’ history. The two Robinsons also went a long way toward reducing racial tensions in Baltimore. When one particularly clumsy reporter couldn’t distinguish between the two, the import from Cincinnati cracked, “Can’t you see we wear different numbers?” They also went a long way toward making the Orioles far more than also-rans for the city’s sports affections behind football’s Baltimore Colts. Robinson yanked the Orioles to the pennant with a Triple Crown season that also saw him become the first and so far only player ever to be named each league’s Most Valuable Player and then become the MVP of the Orioles’ World Series sweep of the Dodgers that October. And he became one of the team’s most enthusiastic clubhouse leaders. A student of the game as well as a hard-edged and productive player who’s still the single greatest position player in the history of the Reds, Robinson came to believe a hard collision with White Sox infielder (and unlikely Mets World Series hero-to-be) Al Weis in 1967 left him something less than the player he’d been to that point. (He missed 32 games with a concussion after his head met Weis’s knee a little too sharply.) He had more than enough left to help the Orioles win that 1969 pennant and continue a Hall of Fame playing career regardless. And, to make baseball history. 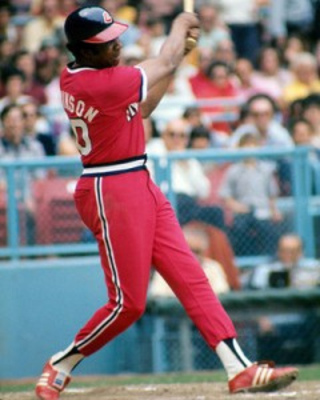 The Orioles dealt him to the Dodgers for 1972 with a kid named Don Baylor on the way to the Oriole outfield. He had a down season with the Dodgers, then was dealt to the Angels (in the deal that made a Dodger of future free agency pioneer Andy Messersmith) where he had a comeback season, then—after clashes with the rebuilding Angels’ rookie manager Bobby Winkles—was dealt to the Indians in September 1974. Robinson’s itch to manage was well known; he’d done it in the Puerto Rican winter leagues for a few seasons. When the Indians fired manager Ken Aspromonte after the 1974 season, general manager Phil Seghi had no hesitation in naming Robinson the next manager. Twenty-seven years after one Robinson broke the colour line at age 27, another Robinson—who let his play on the field and his mostly quiet person off it speak for him racially and otherwise—broke the managerial colour line. As relentless as he was when he played the game, Robinson preferred to break barriers quietly. “Jackie and Floyd Patterson were brave men to go [integration marches], but I couldn’t,” he once said of his reluctance to join the civil rights battle publicly. “Not now. Not until I’m through with baseball. I don’t believe baseball should be a fight for anything except baseball.” But he was aware enough that he’d broken a big one with the Indians and let himself savour the moment and the home run. The bad news was some Indians players less than thrilled over Robinson’s emphasis on physical soundness. (Hall of Fame pitcher Gaylord Perry said infamously, “I’m nobody’s slave!”) As player-manager for two seasons and strictly manager for a third, Robinson’s Indians went 186-189, but he had them with a winning record in the second season before a slow start got him fired early in the third. He’d get three more chances to manage in the majors. He brought the Giants home with a winning record in strike-shortened 1981 but fell back after losing a couple of key free agents, costing him his job again. Then he took over the Orioles on a six-game losing streak to open 1988, after they canned Cal Ripken, Sr. Robinson and the Zer-Os endured fifteen straight losses more. He kept his sense of humour, though. After the Orioles lost their 20th straight, Robinson pulled open his desk drawer to show a pin he’d been given: “It’s been lovely, but I have to scream now.” Reminded that Baltimore radio host Bob Rivers was staying on the air until the Orioles won, the 20th straight loss provoked Robinson to say, “We’re gonna kill the poor guy.” They broke the streak, finished 54-107, but then Robinson managed them to 87-75 in 1989, second behind Toronto in the AL East, earning Robinson Manager of the Year honours. But he moved to the front office after a slow 1991 start and stayed there until he was let go in an Oriole front office shakeup. He moved to the commissioner’s office and the former judge of the kangaroo court became baseball government’s vice president in charge of player discipline, uniform policy (a neat irony there; it was Robinson who introduced the high-cut stirrups players took to wearing in the later 1960s), and other field matters, before getting one more chance to manage. This time, it was with the Montreal Expos. He took them to two winning records and one losing one before the team was moved to Washington. Thus is Robinson the last Expos manager and the first Nationals manager, but it wasn’t always thrills: he was voted baseball’s worst manager in a players’ poll in 2005. But Robinson did manage his 1,000th win a year later; it took him two more years to manage his 1,000th loss. In the interim he had a moment that revealed something deeper about the man himself. On 24 May 2006, after Nats third-string catcher Matt LeCroy allowed seven stolen bases while committing a pair of throwing errors, Robinson threw out the so-called unwritten rules and removed LeCroy while the Astros were still at bat in the seventh inning. But Robinson was personally fond enough and respectful enough of LeCroy that, despite the Nats hanging in to win 8-5, the skipper broke to tears when talking after the game. That was less out of character for Robinson than people believed who knew him only as a hard, determined, take-no-prisoners Hall of Famer who finished his playing career with 586 home runs, 211 runs produced per 162 games, and 107.3 wins above a replacement-level player, which marks him as the fifth best right fielder ever to play the game. After the 1969 season, Robinson made sure the proceeds from his kangaroo court’s fines were donated to . . . Reds catcher Pat Corrales, whose wife died during the season while giving birth to their fourth child. Growing up fatherless (his parents divorced when he was an infant) in Oakland, Robinson—nicknamed Pencils by his friends for his skinny physique—took to baseball to stay out of trouble. (His high school friends and teammates included future Reds outfield mainstay Vada Pinson, future reserve clause challenger Curt Flood, and basketball giant Bill Russell.) The only real trouble he caused was for enemy pitchers and infielders. Baseball was only slightly less blessed to have The Judge than heaven will be. The kangaroo court ought to be a regular riot. Page created in 1.2 seconds with 22 queries.